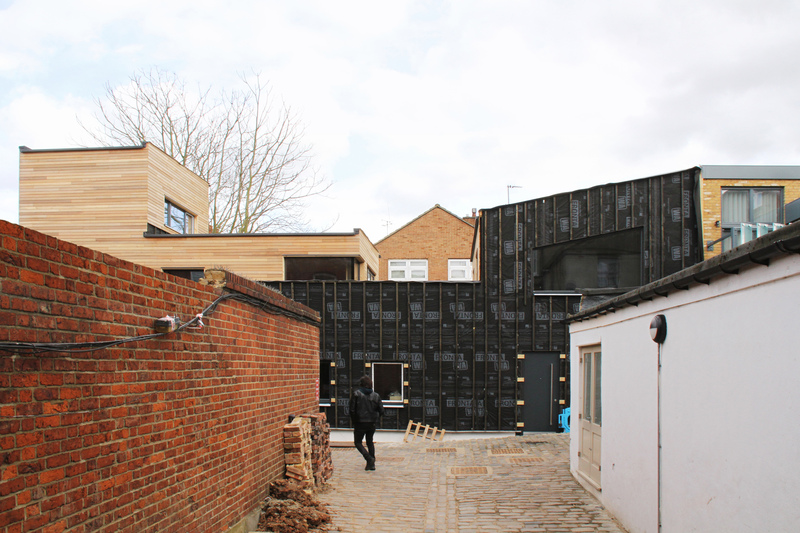 Some of the most interesting projects in our portfolio have been mews properties within the London Borough of Camden, and the planning approval we achieved for this little house was another triumph. The site consisted of a row of seven narrow single storey garages, and Camden Council's planning statement for the site noted "...a replacement single storey building would be acceptable with additional height to be carefully considered on the basis of impact on adjoining properties." Unlike any of the other buildings in the mews, and contrary to the Council's guidelines, we rotated the upper floors south to the sun and the open sky, and away from the buildings across the mews, avoiding direct overlooking and thereby reducing the impact on adjoining properties. This strategy benefited the existing residents as well as our clients, but to achieve this, we needed permission to build higher than one storey and higher than the neighbouring residential buildings. The Council accepted our design proposal, and planning permission was granted for a small Passive House. This self-build project is a low-cost and condensed re-invention of our unprecedented Muse project designed ten years earlier (see link below). It consists of a 3-bedroom family house, entered via a private courtyard, with an attached 1-bedroom house for rental income. On the first floor the family living spaces benefit from South, East and West daylight, and open on to a roof garden. A staircase also leads to the 2nd floor office which will look out over a wildflower meadow. To get the most out of the site, the house has a complex form-factor. However the walls were designed to be 500mm thick, timber framed, and filled with fire-proof mineral wool, and together with vacuum insulation on the first floor terrace and roof areas, full Passive House certification could be achieved.